Recently I took my son to see one of the last remaining “commercial” ice harvest operations in the world. Despite the somewhat exotic sound of this, I didn’t have to travel far; it takes place in my hometown. And while it is a company performing the operation, they aren’t selling the ice alone; it’s part of a whole experience. There’s a camp here that was started in 1897 as a place for families to escape the hustle and bustle of city life by “camping” in a cabin by a lake. Much like any other summer camp you’d think of these days, there’s a dining hall, athletic fields, various water-related activities, and guided hikes, bike trips, and other adventures. The difference is, the whole family gets to go. This place is wildly popular, rather expensive, and has some families who have been coming for 4 or 5 generations at this point. Toward the end of a day, you can see a field of blocks ready to be pushed up the channel on the left. The ice harvest is something they started early on as a practical method for chilling food and drinks through the summer - this actually used to be a big business around New England. 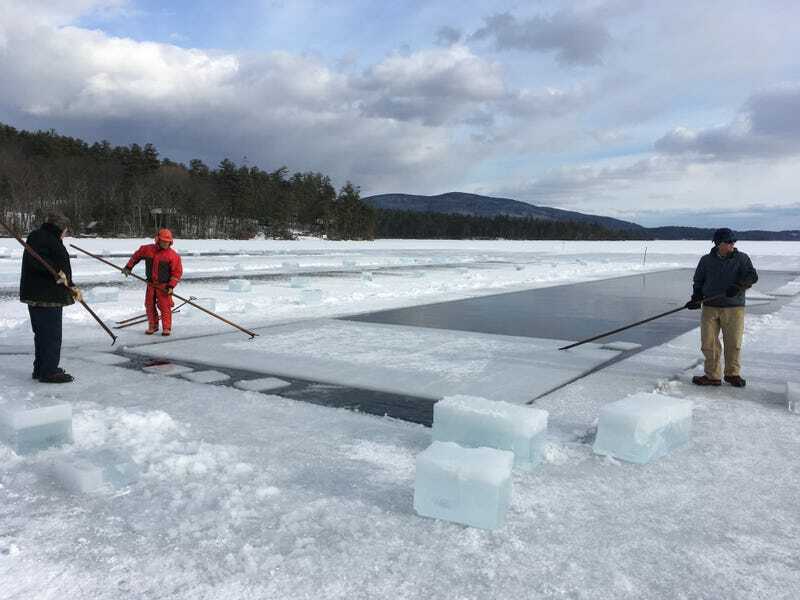 In short, they take big chunks of ice from the lake, store them in an insulated building (insulated with sawdust, by the way), and deliver them to traditional ice boxes in each of the cabins as needed. Most people have probably never even seen a real ice box, but it’s pretty simple, and in principle no different from a modern Coleman cooler. You might see one in an antique store; I’ve seen one converted to a TV cabinet. The whole field isn’t cut with a chain saw, but the edges are freed up that way to get things moving. Every winter when the ice on the lake reaches the desired thickness, they round up their staff - some paid, some volunteer - along with a plethora of custom-built contraptions and spend three to five days cutting ice out of the lake and stashing it in their two ice houses - about 200 tons in total. The guy in the hood on the platform is running the winch, another guy is walking with the hook that pulls blocks up the ramp. I’m sharing this here because I thought some would be interested in the engineering problems that have been pondered, refined, solved, and re-invented many times over the years. From using horses to trucks, hand saws to chain saws, and human power to hydraulic power, there’s still room for improvement here and there. The saw creates a lot of “snow” which someone then scrapes off with a shovel to keep the field clean. As an example of something that was no doubt a massive human-powered effort that’s now a light mechanical job, the saw they use to cut into the ice looks like something that a lot of handy tinkerers have had their hands on over the years. It’s a small (electric start!) gas engine running about a 30" diameter blade that can be raised and lowered with the flick of a lever. It runs on metal skids, and uses each prior cut as a guide to keep itself straight for the subsequent pass. They have a whole set of contraptions making sure each grid is cut perfectly square and straight in the first place. I’m holding on tight to my son’s jacket in for those Panikcy Petes out there seeing a small child near open water. There’s a custom-fabricated winch (also gas-powered, it looks like a brush cutter engine) that helps pull the ice up a ramp where it’s pushed into a flatbed truck by hand. There’s an ancient-looking metal ramp along with a new-looking extended wood platform that bridges the treacherous last few feet of lake where it meets the shore, so the truck can smoothly traverse from lake to land without bouncing half the ice blocks off the back, or breaking through the ice which is often compromised near the rocky shore. Having not been in many years, I can’t say for sure when the change was made, but they used to simply cut a row of blocks, push them up a channel into the loading area, then repeat with the next row. Near the end of a day, you might be pushing blocks more than 100' down a channel. Now, they cut a large grid of blocks about 20' by 20', then float it (unbroken) down the open water space created by the last grid (they call each grid of blocks a “field”). The big saw goes just shy of cutting fully through the ice so that the field stays together, making it easier to move about 100 blocks at a time. With a little encouragement from a metal spike, the blocks separate and they are pushed a short way up a channel, then picked up by the winch and hook system, onto the raised platform. My son had a blast pushing ice along this channel, since so little force is required to move a row of floating ice blocks laterally in the water. After making the short journey onto land, the blocks are slid out of the truck onto a chute with metal runners which is supported by a tractor with forks on the front loader. This way, blocks are slid onto the chute, then the tractor raises or lowers the chute to off-load blocks into the ice house. Blocks are stacked floor-to-near-ceiling and wall-to-wall by hand. This is the most labor-intensive part of the whole process. All summer, tourists are greeted with a wheelbarrow-delivered fresh ice block to chill their beverages as needed, much to their amusement, no doubt. Sitting on a dock in July with a lake-ice-chilled gin & tonic, it’s hard to imagine trucks and other heavy equipment just a few months earlier working out on the surface of the lake just a few hundred feet away, dressed in many layers, working hard to keep a tradition alive. I love that they keep this up, and I don’t see it changing any time soon. Some warmer winters of late have forced the operation into a smaller cove elsewhere on the lake - where the ice forms earlier and more reliably. I’ve heard they tried putting small refrigerators in some of the cabins, but the guests didn’t want them; they favored the nostalgia of the icebox, so long as the camp was willing to continue stocking it with lake ice, and so the tradition persists.